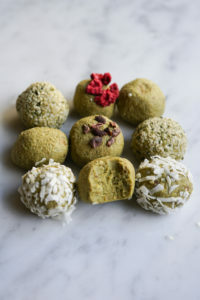 Bliss Balls, Energy Balls, the NEW trend in health and wellness that has taken me a while to love. I made a few (around 5 different recipes: the ones you Google: “the best energy balls”) made some with protein powder, some with oats, some with a lot of dates and honestly didn’t love them. Until a friend asked me to do some for a community event at Athleta Austin (a friends and family sale which was pretty awesome, except that I ended up shopping also!). So since I had to do a demo at Athleta and my experience at making energy balls was pretty limited (I have made many more energy and granola bars), I had to make many batches until I came up with this killer Bliss Ball recipe. 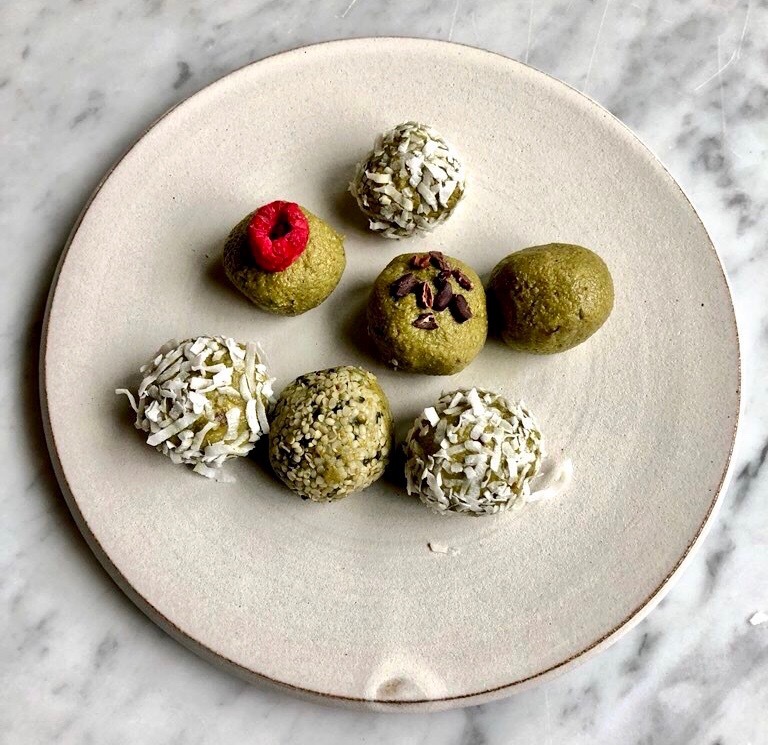 These Bliss Balls are your go to recipe for an energy pick me up treat, perfect for an afternoon, post workout, coffee snack. Meet your new fitness snack or treat. A master recipe you can adapt so many ways! I made mine with Matcha (which I love, but also know that some people don't so feel free to adapt the flavors to your own. Maca would be amazing, cinnamon, golden berries, baobab (my favorite new superfood). The options are endless. These are paleo, gluten free, grain free, dairy free (you can sub the collagen for freshly ground organic golden flax or for a vegan protein powder to make a vegan version. ¼ cup chopped and melted raw cacao butter (I only use Bulletproof: please note: most raw cacao butters do NOT taste good and have a very strong flavor .. Blend cashews in your Vitamix or food processor until finely ground (it will look like almond flour) make sure they are finely ground. Add dates and blend, add the rest of the ingredients and blend to incorporate: don't over blend or they will be very greasy and the taste and texture will be off. Remove the mixture from the blender (I use a blender spatula) and shape into balls (you can fill with a golden berry!) and decorate with the desired ingredients: coconut, cacao nibs or freeze dried raspberries. (They will seem a bit moist but they will set because when cacao butter sets it firms up). Bliss Balls keep stored in a glass container in the fridge for about 2 weeks. Or freeze for longer shelf life in a Ziplock bag. If you want to lower the glycemic index: remove dates and use Xylitol or Monk Fruit from Lakanto to taste. Can you just use almond flour? Hi Naomi instead of cashews? You can try, I haven’t done it this way, please let me know if you make them with almond flour. Happy Baking ! Hey Buddy!, I found this information for you: "BLISS BALLS". Here is the website link: https://www.vanessamusi.com/blissballs/. Thank you.